On Thursday 15 October a new shop opened in the former Motor World shop in Crosspool. 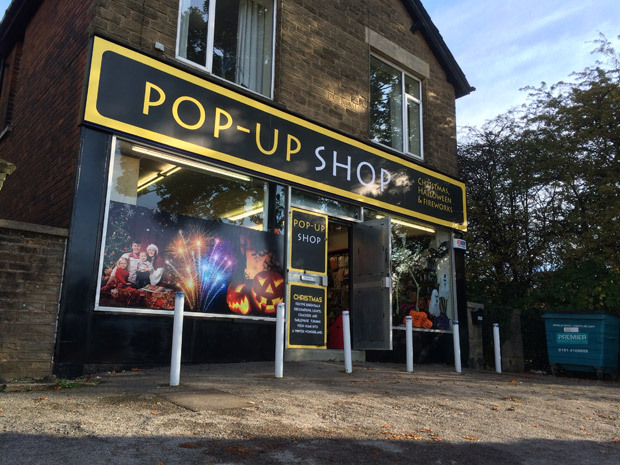 The Pop-up Shop on Lydgate Lane sells halloween, bonfire night and Christmas goods. The chemist on Sandygate Road is expected to eventually move in sometime in 2016. This entry was posted in businesses, news, shops and tagged christmas shop, fireworks, halloween shop, pop-up chemist. Bookmark the permalink. The frontage on this shop would be more in keeping with Blackpool’s Golden mile than Crosspool, thank goodness it won’t be there for long. The planning application for the relocation has now gone live. “Alterations and extensions to building to provide extended retail unit at ground floor with three flats over including two-storey side extension with covered way and accommodation in roofspace, single-storey side extension with balconies over and alterations to roof design of existing building. Motor World, 340 Lydgate Lane, S10 5FU.” The reference is 15/04122/FUL. Comments by December 4th.